Rivets are used to permanently join two plates usually in mechanical applications where it is imperative that joints do not become loose and cause failure. 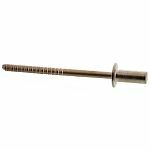  Blind Rivets also known as drive rivets have a mandrel through their centre that once inserted into pre-drilled holes of the parts they are joining, the blind end expands and the mandrel snaps off. They can be installed from only one side making them ideal for areas where access is limited.  Tubular Rivets have a shank hole within the shaft of the rivet and are available with different head styles such as oval, button, flat and countersunk.  Snap Rivets are supplied pre-assembled and simply push into the required holes providing a fast and neat solution.  Solid rivets, or the original rivet. These solid fasteners resist water, vibration, tampering, and other severe conditions. What can be Rivets used for?